LONDON, UK, July 17, 2012 (ENS) – With 10 days to go before the Summer Olympic Games, London is preparing to welcome 14,700 athletes, 21,000 media and 10.8 million ticket-holders to the city. Sustainability is the watchword for the London 2012 Olympic Games, opening July 27 and running through August 12, as well as the London 2012 Paralympics, opening August 29 and running through September 9. The Olympic Park is the largest new urban parkland in Europe for 150 years. Spectators have to be fit to attend the Games. 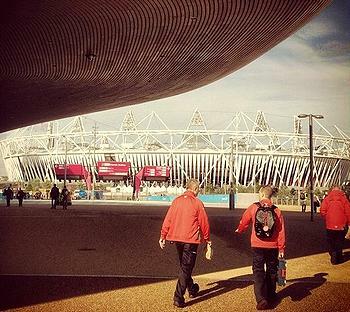 For the first time, visitors will not be permitted to drive onto the Olympic grounds; there are no parking lots. Public transport is the only option for spectators, with some park-and-ride sites outside the city where visitors can park and come in on the bus. The only exceptions are private car access for disabled drivers and 4,000 BMW cars, including 200 electric cars, that will transport athletes and officials around London in dedicated traffic lanes. Environmental activists have called for the use of only electric cars or that VIPs take public transport along with everyone else. But BMW contends that the average carbon dioxide, CO2, emissions from its Olympic and Paralympic fleet is just 116 grams of CO2 per kilometer (g/km). 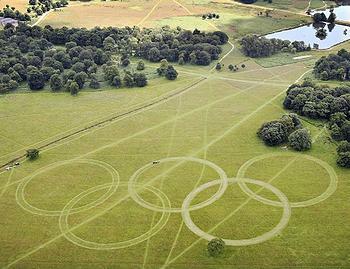 The BMW fleet meets the London 2012 Organising Committee’s 120 g/km requirement. In comparison, the average CO2 emissions from all cars sold in the UK last year was 138 g/km. Britain’s public transport infrastructure has been improved to accommodate the high demand during the Games with increased capacity; new trains; cleaner, safer, and better-staffed stations; and better accessibility. The transport infrastructure for the Games, particularly for Stratford, the main center of the Olympic Park, makes the area one of the most connectable places in Europe for public transport. A new Stratford International Station has been constructed, there are two different London Underground options, the London Overground, and the new high-speed Javelin trains that travel at more than 140 mph. The Docklands Light Railway has been upgraded in the area. A pioneering energy walkway leading to the Olympic Park will be lit 24/7 by the footsteps of a million spectators during the Games. The award-winning British renewable technology by Pavegen Systems Ltd. was commissioned by the Olympic Delivery Authority, ODA, to light the temporary bridge leading from West Ham Station – one of the three transport hubs feeding the London 2012 Games – to the Olympic Park. 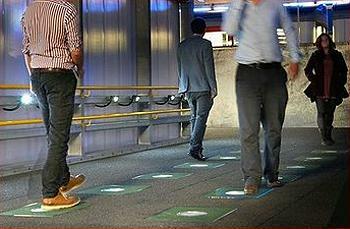 Twelve energy-harvesting floor tiles along a walkway connecting the West Ham Station to the Greenway walking route to the Olympic Park, are expected to receive more than 12 million impressions, generating 72 million joules of energy. That’s enough energy to power a small electric car for 397 laps of the Olympic athletics track or charge 10,000 mobile phones for an hour. The power will be used to illuminate the walkway for eight hours at full power during the night, and 16 daylight hours at half power. As well as 24-hour lighting, the floor tiles will produce an energy surplus of 35 percent, to be stored in batteries onboard the units as a contingency measure. The Active Travel program has made it easier to walk or cycle to the games, with the introduction of new maps highlighting the variety of cycle routes around the Olympic Park, guides for over 150 walks and 425 rides, and an easy-to-use journey planner offering cyclists a choice of direct, quiet or recreational routes. A new phase of the program offers 18,800 free cycling parking bays covering all venues, with 7,000 at the Olympic Park alone. Spectators can access a free “keep you going” cycle maintenance service, which will be available at the Olympic Park, Box Hill, Hampton Court Palace, Hadleigh Farm and Brands Hatch. London 2012 is the first Olympic Games to run a program of this scale, and is working with Transport for London to use the power of the Games to encourage walking and cycling across the UK. “An investment of over five billion pounds has been brought forward to try and provide the best possible public transport infrastructure,” said Shaun McCarthy, chair of the Commission for a Sustainable London an independent watchdog group responsible for ensuring the Games’ sustainability goals are being tracked and met. The 2012 Games are the first to measure their carbon footprint throughout the course of the Olympics, from the construction of new facilities – including the naturally lit and ventilated Velodrome – to the energy usage during the games. Twenty percent of energy used during the games is to come from renewable resources. The Olympic Delivery Authority is responsible for the infrastructure left behind after the games, with a target of 50 percent reduction in carbon emissions in 2013. Even the Olympic flame, set to enter London on July 27 aboard the royal barge Gloriana, will have a reduction in fuel use from previous games. In the original plan, there was to be a two-megawatt wind turbine on the Olympic site, but that plan was canceled. As a result, rather than achieving the 50 percent carbon reduction that was required in the games’ sustainability plan, only 43 percent will actually be delivered in the Olympic Park. McCarthy and his team are watching the waste stream with a goal of zero waste flowing into the landfill. The London Organising Committee of the Olympic and Paralympic Games, LOCOG, aims to achieve this through a mix of composting, recycling, and reducing packaging used on site. Olympic Village, which will house 77,000 athletes during the Games, is the first development built to code for Sustainable Homes Level 4, a very high standard of sustainability in the UK. The buildings are 80 percent more energy efficient, and significantly more water efficient, than most existing homes. After the Games the Olympic Village will become 3,800 permanent houses in a new urban precinct. Construction of the park and the Olympic Village involved redevelopment of a vast brownfield site on the eastern edge of London in the valley of the River Lea. To conserve biodiversity, create new urban green spaces, and bring people closer to nature through sport and culture, LOCOG is making direct enhancements to the ecology of the Lower Lea Valley. The cleaned up and re-profiled river valley, once contaminated industrial land, provides both new wildlife habitats and flood alleviation. Organizers have planted more than 4,000 trees, 130,000 plants and bulbs and over 300,000 wetland plants.